Robotic surgery marks an exciting evolution in the field of laparoscopic surgery. This groundbreaking technology gives the surgeon the ability to perform minimally invasive procedures with greater precision and efficiency than other surgical techniques. Due to the flexibility and control offered by robotic surgery, the doctors at our New York practice can perform delicate and complex procedures that would have been extremely difficult or posed a substantial risk to patient safety using traditional surgery. To learn more about robotic surgery and whether it is right for you, contact our office to schedule a consultation today. Robotic surgery is a type of minimally invasive technique, used as an alternative to traditional open surgery to treat numerous health conditions. Similar to other laparoscopic procedures, robotic surgery uses a series of small incisions, which allow a camera and surgical instruments to be introduced into the body to perform the procedure. During surgery, the surgeon views the internal environment through a high definition 3-D visualization system, giving them greater depth perception and more detailed views than traditional methods. The surgeon controls the movement of the robotic arms from a remote console in the operating room, allowing for 360-degree articulation capabilities and unparalleled precision. The robotic system's computer technology translates the surgeon's hand movements into micro-movements conducted by four robotic arms. The systems also allows the doctor greater control and eliminates the risk of hand tremors. This technique facilitates complex surgeries in areas of the body that are especially difficult to navigate, like the abdomen, and the technology can be used to reconstruct, alter, or remove tissues. Our surgeons have had great success implementing robotics in hernia repair and gallbladder removal surgeries, and have expanded its scope of application to include many additional abdominal procedures. Our doctors are at the forefront of advancing robotic surgical techniques. In fact, we are the first practice in New York to offer robotic-assisted procedures in an ambulatory (outpatient) setting. As a result of the excellent patient outcomes we have been able to achieve, overnight hospital stays are not required for many of the surgeries that we offer. This means that our patients spend even less time away from their daily routines than some other minimally invasive surgical techniques. Our surgeons have spent years developing their skills using robotic-assisted procedures and are widely recognized as pioneers in the community. 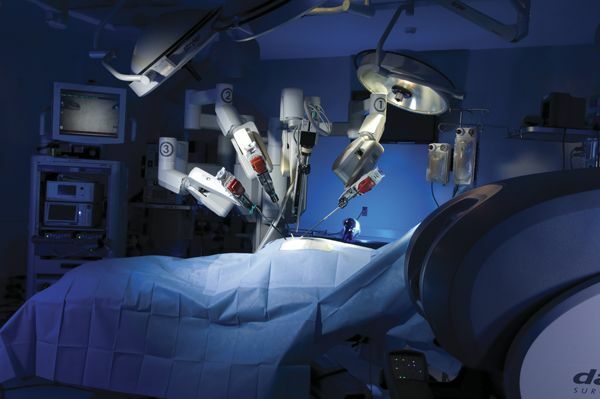 The benefits of robotic surgery honor our commitment to patient health, safety, and well-being. If you would like to learn more about your treatment options and whether robotic surgery is appropriate to treat your medical condition, schedule a consultation with one of our doctors today.